It is the second of three 24-hour strikes involving Ireland-based pilots directly employed by Ryanair. The pilots’ union said that talks on Wednesday between the two sides did not lead to any “material change”. Ryanair said if a strike planned for next week was not called off it would cancel 16 flights to and from Ireland. The Irish Airline Pilots’ Association – which is part of the Fórsa trade union – is in dispute with Ryanair over pay and conditions. The pilots’ concerns are centred on Ryanair’s proposals on seniority, as well as procedures for the allocation of base transfers, promotions and annual leave. Late on Thursday, Ryanair tweeted a copy of a letter from its chief people officer Eddie Wilson to the national secretary of Fórsa. In it Mr Wilson said that following Wednesday’s meeting between the airline and the union “nothing has progressed”. 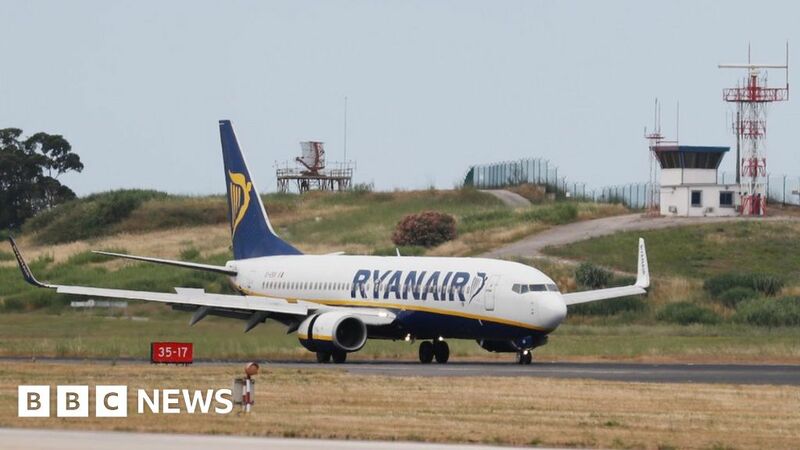 He added that if Ryanair did not hear back from the union by 19:00 BST on Thursday calling off “this unnecessary strike”, which he said was supported by by “just 25% of our Irish pilots”, then the airline would cancel 16 flights out of more than 290 to and from Ireland next Tuesday. “We can readily re-accommodate this small number of customers on other flights,” added Mr Wilson. Ninety-nine percent of the airline’s directly-employed Republic of Ireland-based pilots voted in favour of action, but Ryanair said that they make up just 25% of its Irish flight crew. Most pilots flying for Ryanair are self-employed, which is why the airline is able to continue most flights. Separately, Ryanair cabin crew are also due to go on strike on 25 and 26 July. The airline has cancelled up to 600 flights over what it calls the cabin crew’s “unjustified” action. Almost 50,000 customers flying from airports in Belgium, Portugal and Spain were affected, but earlier the airline tweeted that more than 85% of them had been “re-accommodated” on alternative flights or had applied for full refunds.